On our second day in the city we woke up hours before the sun in order to join the monks of Wat Pho on their daily circuit to collect alms; an experience we booked using the website Withlocals.com. As nearly 94% of Thailand’s population practices Buddhism, the religion is an extremely prevalent part of the country’s culture and the Thai way-of-life. With our appetite already wet from our experience at Wat Pa Tam Wua just days before, we were excited to get another taste of the ‘Land of Buddhism’, albeit this time in a more urban setting. Monks are highly revered amongst the Buddhist lay community, who show their support by supplying food, medicine, clothes, and everyday items in exchange for spiritual guidance, blessings, and teachings by the monks. Early each morning, monks living at the various temples in Bangkok walk throughout the city to collect these food donations from the locals, and provide a blessing to them in return. The monks have taken vows to only eat the food that is given to them, so individuals and families will wait on their routes each morning to gift them a smorgasbord of home-made delights and/or items bought pre-packaged at the market. This particular day that we had joined happened to be a Buddhist holiday, so the Monks made out very well; by the end of our 1.5 hour walk each of the 6 people in our small cohort was carrying two big armloads of tasty looking donations. The Eiffel Tower, The Statue of Liberty, and The Grand Palace (well, sort-of). All tourist destinations that visually define the city they call home. It is near blasphemy to visit their cities and not shuffle through these mega-attractions just to say you did. That was the notion that compelled us to visit The Grand Palace, an ornate complex of buildings located in the center of Bangkok, which serves as the official and ceremonial place of residence for the monarchy. 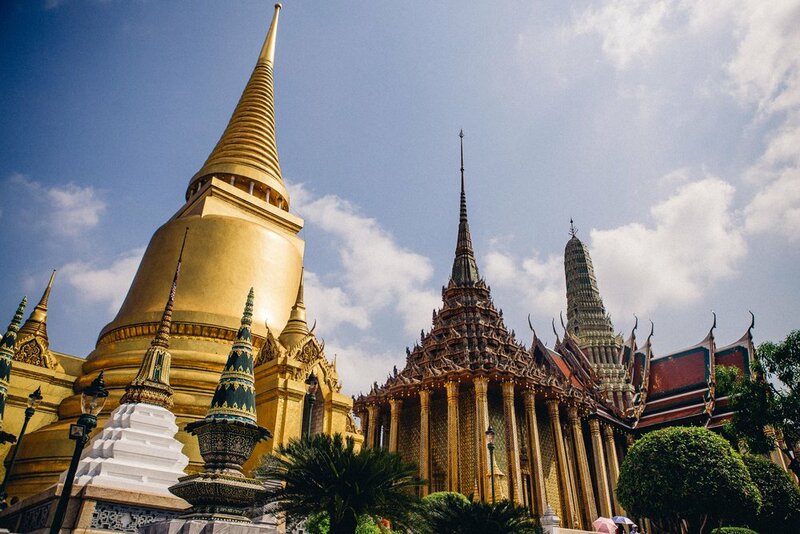 Though beautiful, our visit to The Grand Palace felt much more like business than pleasure as we sweat through our clothes packed shoulder to shoulder with a never-ending river of tourists from nearly every continent. Once inside, our goal was to get out as fast as possible; and maybe take in some of the beautiful architecture along the way. A Buddhist holiday, with celebratory visitors stacked so thick they seemed to be crawling out of the ornate tile-work, may not have been the best day to see The Grand Palace; but hey, at least now we can say we did it.